The Fellowship was fortunate enough to obtain a copy of SNAPSHOT #1 from Image Comics. The story is by Andy Diggle, with art and cover by Jock, and lettering by Clem Robins. Meet Jake Dobson – a regular guy who works at a comic book store called Near-Mint Rhino. One day he finds a cell phone in the middle of Golden Gate Park. After he gets to work, Jake examines the phone and discovers pictures of murdered man. The phone rings and the caller identify himself as a homicide detective from the San Francisco Police Department. Jake tells the detective what happened and where he is located. The detective shows up to retrieve the phone…and kill Jake. He narrowly escapes to heads to a nearby police precinct and recounts the story. Things really get complicated and dangerous for Jake. 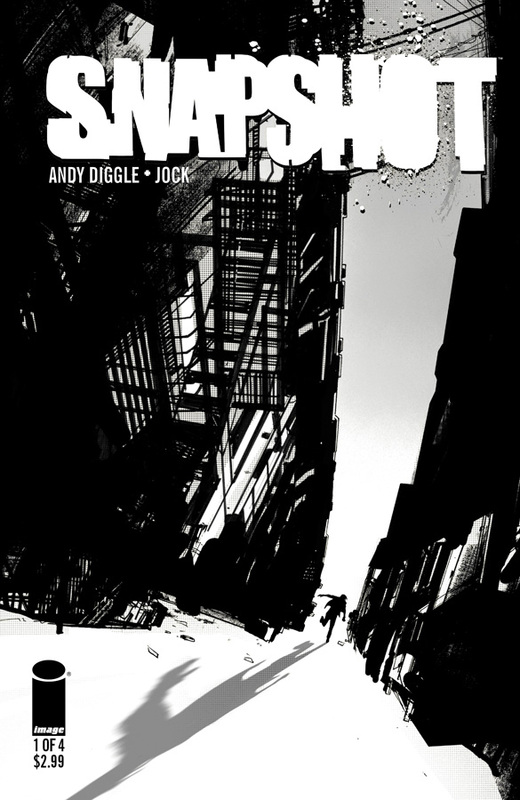 I liked seeing Jock’s artwork in black and white; it adds something to the vibe of the book. I love the surprises that Andy Diggle threw our way, especially the last one. Can’t wait to read the next issue to see what happens! SNAPSHOT #1 is in stores now and available at www.imagecomics.com.